Whether you believe in love at first sight or not, you can’t deny the fact that your lawn is the first thing a visitor is going to see when they come to your home. Unless you’re a monster, you’re going to want the guest to love your house. First impressions are critical, so here are a few ways you can really make your lawn stand out! Have a Garden That Really Blooms! One surefire way to guarantee that your lawn catches the eye of a bystander is a colorful, well-designed garden. Nothing makes a neighbor turn green with envy quite like having them look across their drab and desolate yard to witness your flowers bloom. Like Dorothy, they’ll be transported to a world of color only to realize that they’re still stuck in Kansas. Yet, one cannot just plant a handful of seeds in a pot and call it good. A beautiful garden requires patience and an eye for design. At Cape Cod Lawn Care, our experts strive for perfection and will work with you to turn your dream garden into a reality. If you’re proud of your lawn, there’s no reason that it should only be marveled at during the day! Illuminate your beautiful yard with strategically positioned landscape lighting. Not only will it let you show off 24/7, it also strengthens the security of your home, will help prevent an accidental fall, and guarantees you won’t be searching for your key in the dark! Having a beautiful garden and a beaming yard at night is great, but there is one key component to having a landscape to be proud of that is constantly overlooked. We’re talking about the driveway. Yes, the driveway. It’s the first thing you see when you get home, and the last thing you see when you leave. A lush garden won’t be enough to deter the eye from the gaping cracks or the large oil stain on the driveway. At Cape Cod Lawn Care, we look at every facet of your lawn, and that includes the concrete! Not only can we repair your driveway, but if you want to truly start over, we also install! Similar to the driveway, the perfect lawn requires elegant and thought-out walkways. You don’t want to have your guests getting their shoes muddy, do you? And how will you host your family and friends without the perfect patio? Picture it now, you lead the way down your stone walkway, stop by your garden to literally smell the roses, and suggest your guests take a seat around the fire pit. With the flame ignited, you see the look of awe illuminated on their faces as they attempt to take it all in. It’s a pretty good dream, right? It doesn’t have to remain a dream. We’ll guide you step-by-step through the process so that you get the walkways and patio that your heart desires. Your landscape is breathtaking, your neighbors are jealous, and you feel the warmth of pride every time you come home. That’s great! But you’re not done. In fact, you are never done. The key to having a gorgeous landscape is upkeep and never giving up. The plants must be watered, the grass must be cut, and the concrete has to remain intact. If this stresses you out just thinking about it, do not worry! Cape Cod Lawn Care is here for you every step of the way. We offer on-demand mowing, tree removal and care programs, irrigation maintenance, and oh so much more! 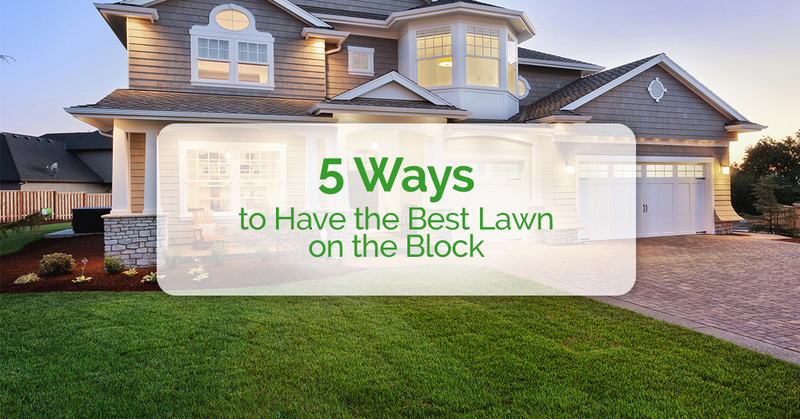 We know, we know, the title of the blog says there are only 5 suggestions to having the best lawn on the block, but technically it only had to have 1, and that is Cape Cod Lawn Care. We’re here for all of your landscaping needs and if you truly want to impress your neighbors, we’re the ones to call. Contact us now for a free estimate and we’ll work with you to create a landscape that you’re proud of! What are you waiting for?